Additionally, Daniel Melter of M-Squad was co-founder and chairman (2006 - 2013) of MobileMonday Germany bringing German and international mobile practitioners together to discuss topical mobile subjects. Major Mobile Players: We have worked with major German mobile players  mobile operators, car manufacturers, and system integrators  we have managed the launch of mobile services on several German portals. Multiple industries: Through our consulting projects we understand the opportunities and key success factors for mobile services in a wide variety of industries both today and over the next five years. More than average we have been involved in the mobile entertainment and mobile consumer service industry. 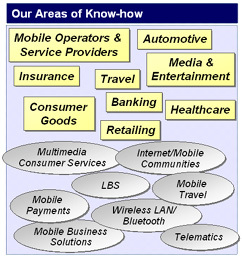 Connected Value Chain: We address the challenges of the mobile internet value chain and technology for both consumer and business applications. Two Worlds Meet: We have unique expertise in resolving the issues that mobile operators and content, application and technology providers face. M-Squad GmbH was founded in July 2001, with much conceptual work dating from late 2000 onwards. Previously, members of M-Squad were instrumental in developing the Mobile Internet consulting business at Detecon International (at the time: Diebold Deutschland), a leading German management and technology consulting company.